Joseph Clayton Clark (sometimes misspelled Clarke) was a British artist and illustrator, best known for his illustrations of characters from Dickens, which he signed ‘Kyd’. Born in Peel on the Isle of Man in 1856 or 1857, the son of Lauris and Eliza Clark, Joseph Clayton Clark became a prolific artist for London publishers, as well as designing cigarette cards, postcards and working for a single day on Punch magazine. 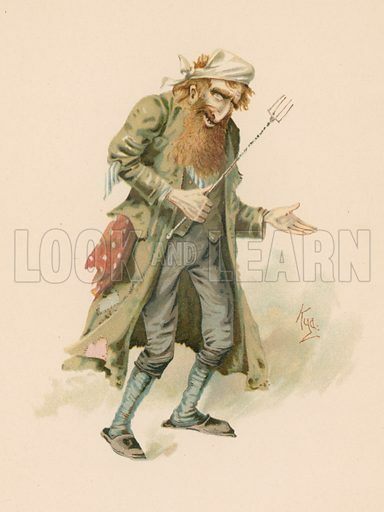 In 1887 he began illustrating Dickens’s characters for Fleet Street Magazine and two collections appeared soon after: The Characters of Charles Dickens (1889) and Some Well Known Characters from the Works of Charles Dickens (1892). These character sketches became a popular series of postcards. From 1927 he made his living creating watercolour sketches of Dickens’s characters which were sold through the London book trade. Major collectors included those of Dickens’ scholar Tom Wilson, who had 331 of Clarke’s drawings, and wine merchant F. S. Cosens, whose 241 Clark watercolours were auctioned in 1890. 598 drawings were acquired by the British Museum in 1910 and another major collection can be found at the University of Texas. Outside of his Dickens work, ‘Kyd’ also illustrated humorous series such as ‘Some Typical Newspaper Readers’ (c.1900), ‘The Book and Its Reader’ and ‘London Types’. He was married in 1889 to Agnes Roberts their children included Dora (b. 1891), David (c.1892), Constance Winifred (1892), Grace (1895), Josephine Agnes (1896), Rose Frances (1897), Joseph Cecil (1900). In around 1892, Clark moved with his family to Chichester in West Sussex. He died in Hammersmith, London, in 1937, aged 80. Many more pictures by Joseph Clayton Clark can be found at the Look and Learn picture library.